On 8–9 September I attended the Art and Christianity Enquiry (ACE) symposium in Cambridge: ‘In glass thy story‘, a two-day symposium addressing over 70 years of innovation and iconography in the glass art of British and European churches and cathedrals. On the first day I contributed a paper on the change in direction that prompted the adoption of a more vivid and bold approach to stained glass design in the Llandaf diocese. This enlarged an observation made on pages 268–9 of Stained Glass from Welsh Churches, and presented the opportunity to show the work of Welsh artists Howard Martin, John Edwards, Tim Lewis, John Petts and others to a distinguished gathering of British and continental artists and scholars. The symposium was held at Robinson College, Cambridge. This presented the opportunity to see works by John Piper and Patrick Reyntiens in the chapel of the college, one of which is a small and intimate window, the other a large and ambitious work occupying much of the wall behind the altar. After my lecture, the proceedings continued with a short performance by the pianist Patrick Hemmerlé in the chapel, offering the opportunity to contemplate the work in conjunction with music by Debussy and Ravel. Tom Denny and Sophie Hacker discussing his work in St Catherine’s College Chapel, Cambridge, with his recent window above. 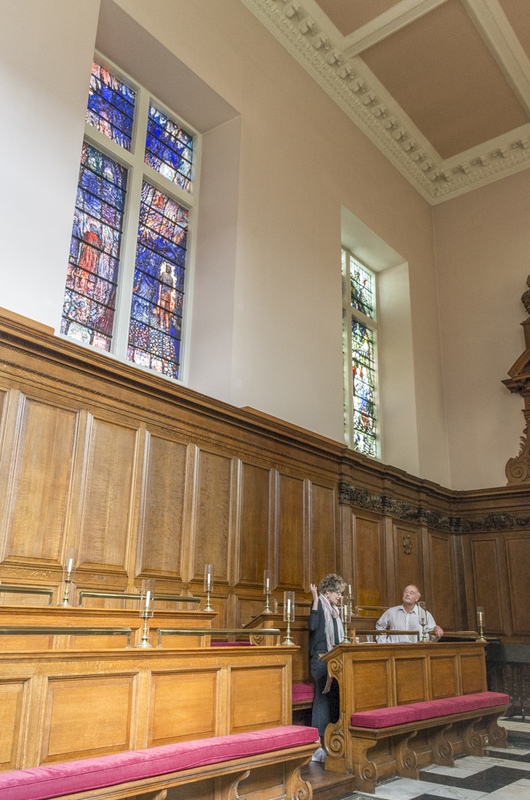 The opportunity to engage with another recent work in Cambridge was provided by a visit to St Catherine’s College Chapel, where the artist Tom Denny spoke about his work in conversation with Sophie Hacker, and in particular about his window in the chapel. The final talk of the conference was about the windows designed by the abstract artist John McLean for Norwich Cathedral, installed since I last visited the cathedral. As I came away I couldn’t help thinking about the striking difference between these wholly abstract windows, saturating their aisle with colour, with the window we looked at by Tom Denny. This was also a work which was rich in colour, and might, in combination with two other windows in a similar kind of location, have also created a colourful immersive environment. But the work of Denny was figurative and suggestive, an intelligent interpretation of texts from Ecclesiastes, and also brilliantly painted. Were the windows by John McLean, with their absence of any apparent message, suggestive of a church that does not know what to say anymore, or at least a church that chooses to say little? In glass no story? Such things cannot be argued one way or another in a few lines here. I didn’t talk about theology or narrative in my talk and lots of us were perhaps on safer ground with style and form. But the rare opportunity to think about these things at the ACE conference was a welcome one. As part of my work on ‘The Cult of Saints in Wales‘ project, I have been co-curating an exhibition of medieval and early modern manuscripts of saints’ Lives, poetry addressed to saints and saintly genealogies at the National Library of Wales. It has also been an opportunity to display a couple of the hundreds of cartoons acquired by the National Library from Celtic Studios in the late 1990s. The figure of Illtud from Mountain Ash, and the scene showing David, Padarn and Teilo leaving for Jerusalem from Ebbw Vale are displayed with illustrations of the windows on the interpretation panel. In addition, John Petts’ design for his first window at All Saints, Penarth is included in the show, as well as the scale drawing by A.L. Wilkinson of his saints window at Peterston-super-Ely. The latter comes from the diocesan archives at the Library, which include many such drawings submitted as part of the process of obtaining a faculty. I designed the exhibition displays which include my photographs of modern and medieval images of saints, and some of these are displayed as framed prints. To coincide with the exhibition, I will be speaking at the National Library about images of saints from churches in Wales on 17 May, as well as doing a gallery talk on 29 March. The exhibition opens to the public on 18 February and runs until 10 June 2017. I am grateful to Robert Drake at the Twentieth Century Society for his review of Stained Glass from Welsh Churches, published in the last number of their magazine (October 2015, 3). The review naturally pays attention to the twenteth century material, which actually occupies almost half of the book, and is illustrated with a panel by John Petts from Briton Ferry. The mid-twentieth century material proved quite difficult to write about, as there have been hardly any overviews of stained glass of the period, except in those books that attempt a history of all stained glass in Europe and North America, in which the British material leaps nervously from Henry Holiday or Christopher Whall to John Piper, maybe via Evie Hone or Veronica Whall. It is suggested that the most interesting section of the book is perhaps in chapter ten, and the eventual emergence of modernism in stained glass in Wales in the later 1950s and 60s. This is something that I am going to talk about in a lecture in Swansea next Friday (27th) in the Glass Department. To my mind the chapter does emerge from the very long preceding chapter with a bit of colour and vigour. The review is available online on the Twentieth Century Society website. To the readers of the review I might add that there is a misunderstanding about the funding for the book, which was (unfortunately!) not at all funded by the AHRC. My thanks to Elizabeth Siberry for reviewing Stained Glass from Welsh Churches in the 2015 issue of Brycheiniog, the journal of the Brecknock Society and Museum Friends. She mentions two shortcomings of the book. One was that the locations of the churches in remote locations will be unfamiliar to those without a good knowledge of Wales, and I am reminded that I had intended to add a map to the volume to help with this. As things worked out I simply ran out of time when completing the design of the book this time last year, although I had not yet worked out in my mind how I was going to reference several hundred place-names on a single map. The other was that there are important windows in the old county of Breconshire (Brecknock) that are not mentioned in the book (as there are throughout Wales). One that she mentions is John Petts’ east window of 1989 at the Church of St Mary, Brecon, which I overlooked in favour of other windows by the artist, partly because it was included at a generous size in Alison Smith’s chapter on the work of the artist in the 2010 volume Biblical Art from Wales. In fact I tried to complement the illustrations in her chapter by including photographs of windows for which only the cartoons were illustrated, and his east window at Llansteffan, which was represented in Alison Smith’s chapter by a photograph of him working on the window. In this instance the window was reproduced in the Carmarthenshire and Ceredigion Pevsner (2006), but as it was such a personal window, it seemed particularly important to the history of stained glass in Wales. Stained Glass from Welsh Churches is an attempt to present a full range of stained glass in the churches of Wales, and a book of the best stained glass in Wales would have been a different book and even more subjective. Mentioned in the review are Carl Edwards’ windows at Llyswen and David Pearl’s windows at the (now closed) Catholic church in Crickhowell, and these are perhaps of particular importance. Also in the book from the old county are details from the fine Tractarian church at Beulah and the excellent Modernist work of Harry Harvey at Maesmynys (the images far too small to show off this window). C.E. 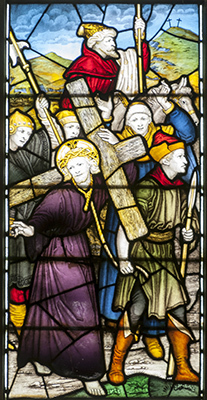 Kempe, Christ Carrying the Cross, 1903, Church of St Mary, Builth Wells, detail of the east window. So what else from Breconshire might have deserved a mention in the book? Along with John Petts’ window in Brecon there are good windows by Powell’s and Horace Wilkinson in Brecon Cathedral. Another important work in Brecon is the unusual window by Clayton & Bell to J.P. Seddon’s design at Christ College Chapel, Brecon, which merited a colour illustration in Martin Harrison’s Victorian Stained Glass (1980). Now part of Brecon, the church of Llanfaes is represented in the book by a late Morris & Co. window, but not the east window designed by James Hogan at Powell’s in 1924. At Builth Wells I found and illustrated a small window in Alpha Chapel that I attributed to Burlison & Grylls, partly because of the amount of their late work in the area, notably nearby at the parish church where there are large late works by them. There is also a large east window of by C.E. Kempe that I tried, and failed, to find a home for in the book. A search for windows in the county is possible by searching for churches in the county of Breconshire/Brecknockshire on the Stained Glass in Wales Catalogue, although I have much more to add from my archive when I have time one day. The catalogue also shows locations of the churches listed on Google maps. And if you’re wondering where Breconshire is, it’s the lower part of central Wales. Today marks the beginning of the Penarth Book Festival, and I will be speaking about the book, and about other stained glass in Penarth, on Sunday 19 October at Trinity Methodist Church. The church has one of the best collections of stained glass at a Methodist Church in Wales, and the Anglican churches of St Augustine and All Saints also have notable collections of glass. At the Church of St Augustine there is glass by Alexander Gibbs made for William Butterfield’s church, and also windows by W.G. Taylor, Robert Newbery and Clayton & Bell. The Church of All Saints has the distinction of being the only church in Wales where stained glass was provided by Harry Clarke, but unfortunately this was lost in 1941. 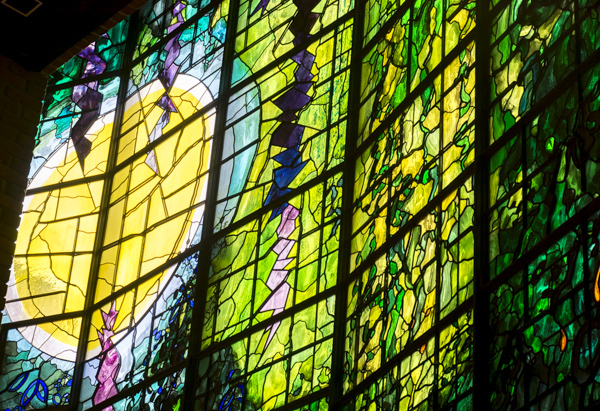 When the church was rebuilt after the war in the 1950s Arthur Walker designed windows for the church, but a change of heart by the Diocesan Advisory Committee in the late 1950s brought the commissioning of more Modernist works by Francis Spear, John Petts and Powell & Sons. Both of these Anglican churches are among the more serious omissions that I am aware of on the Stained Glass in Wales Catalogue, although the stained glass at Trinity Methodist Church is included. When I was there in 2008 one of the windows was damaged, so I will be interested to see if it has been restored so that I can see the whole scene. The earlier stained glass at the church, and possibly all of it, was made by the studio of H.J. Salisbury, and they also provided the painted reredos of the Last Supper.